Oldie but Goodie is a monthly column where we feature noteworthy restaurants, cafes or bars that have been open at least six months and are worth a try. Beijing Restaurant brings authentic cuisine from China’s capital all the way down to the dirty South and has been in business for more than 30 years in Shekou. If that doesn’t sound prestigious enough, take a look at the outlet’s description on Meituan, and you’ll see that it was once visited by none other than Deng Xiaoping. As an establishment specializing in cuisine from Beijing, it’s only natural that roasted duck makes an appearance on the menu. The eatery’s signature roasted duck (RMB198) is made with birds specially bred in Beijing and cooked for about an hour in a traditional fruitwood-heated oven. When served, the duck is brought to the table in one piece and sliced right before your eyes by the chef. Once the meat is stripped from the carcass, you’ll be given the option of having the bird’s remains made into a soup for RMB12: do it, you’ll need it for when the grease kicks in. Enjoy the duck meat the ol’ fashioned way, by wrapping it with cucumber and green onion inside a steamed pancake and dipping the Beijing-style wrap in plum sauce. The taste is both smoky and refreshing, while the mouthfeel ranges from oily to crispy. 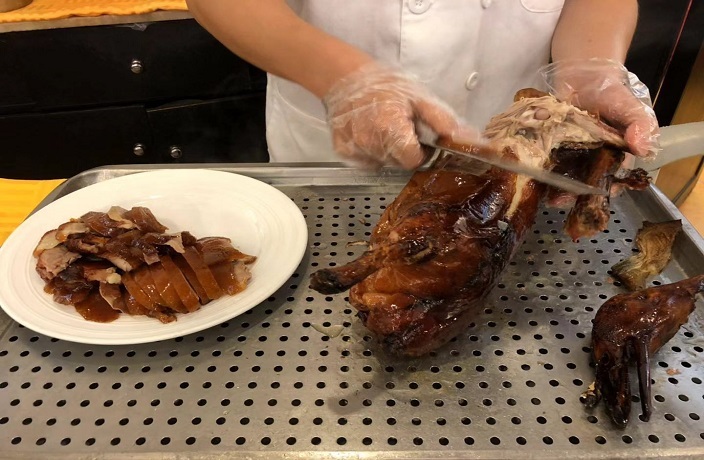 If the duck doesn’t float your boat, browse Beijing Restaurant’s extensive menu (no English translations, but images are provided), which features such classics as kung pao chicken, as well as pig intestines (yum!) and an array of North-style cakes and snacks. In addition to the main dining hall, patrons looking for a more intimate dining experience can enjoy the establishment’s private booths. We, though, recommend taking in the sights and sounds of the main dining area. After all, it’s the jovial Beijing atmosphere (together with Beijing cuisine) that you are here for, innit? See listing for Beijing Restaurant. For more Oldie but Goodie(s), click here. The monthly scoop on Shenzhen's ever-evolving food and beverage scene! With the shop’s changing menu and their willingness to experiment with all kinds of Chinese flavors, you’re bound to taste something new. Below is a list of places and/or events for you pig out and get into the CNY spirit! Watch us gag on a sordid selection of fast foods likely only found in China. Different from the classic Beijing duck, which has a thick layer of fat, pigeon skin is a lot thinner, less fatty and has a salty taste.